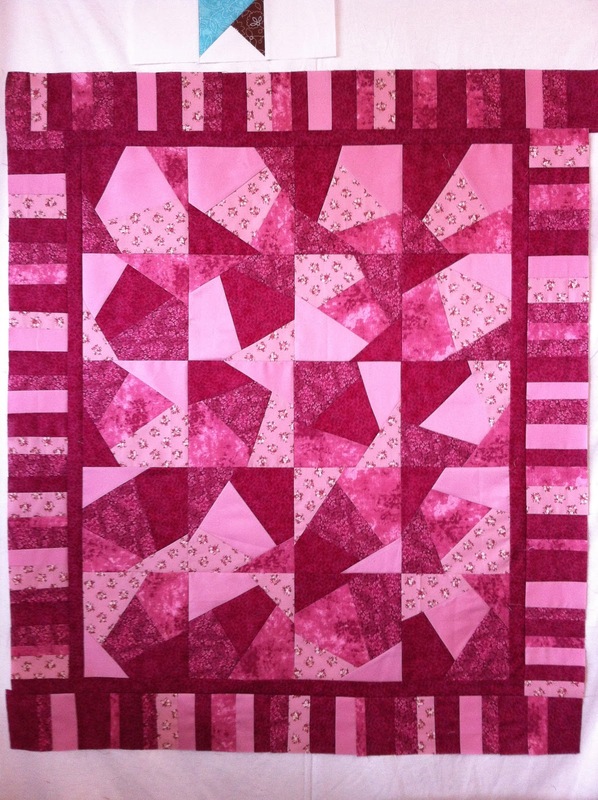 My quilting friend, Noell, came back from her winter down south with this lovely crazy quilt pattern that she shared with the Dalemead Quilt Guild that meets southeast of Calgary, Alberta. The blocks are made from 5 fat quarters of fabric. I had a half meter of the darkest fabric and this baby quilt used up all the fabrics. There is a piece of the larger fabric left, but not enough to even make the binding, so if you want binding, you'll have to add fabric for that. Step One: Cut four 8" squares from each fabric. We stacked our fat quarters and cut through all 5 layers at once to make 4 neat stacks of 8" squares. Set three stacks aside and work with one stack at a time. Step Two: Cut your stack of squares into 5 pieces. Avoid parallel cuts, sharp points, and intersections at outside corners. 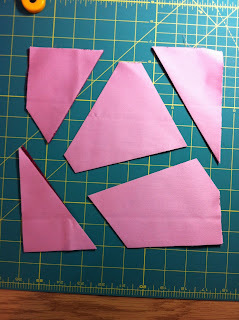 You may want to sketch out your cuts on paper before actually cutting your fabric. As you cut, label the pieces that are cut off from 1 - 5 (1 being the first piece cut off and 5 being the last piece). You may cut all stacks the same or treat each stack differently - the latter will make a more interesting finished piece. Step Four: Sew blocks back together with scant 1/4" seam in REVERSE ORDER (piece 5 to piece 4, then add piece 3, add piece 2, add piece 1). You will notice that seams might not match perfectlyl. Don't worry, you will trim them to size later. 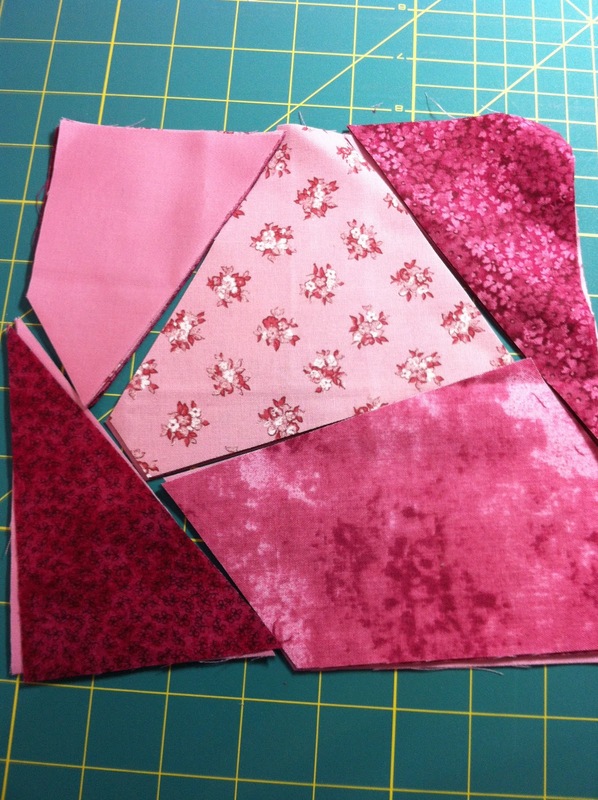 Press as you sew and when finished, trim your first stack of blocks to 7"x7". 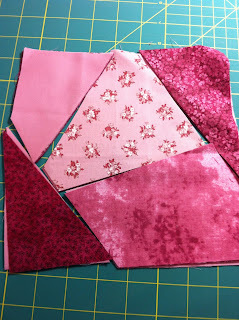 If you can't get 7" out of your blocks, just trim them all a little smaller - as long as they are the same size, your quilt top will look fine! 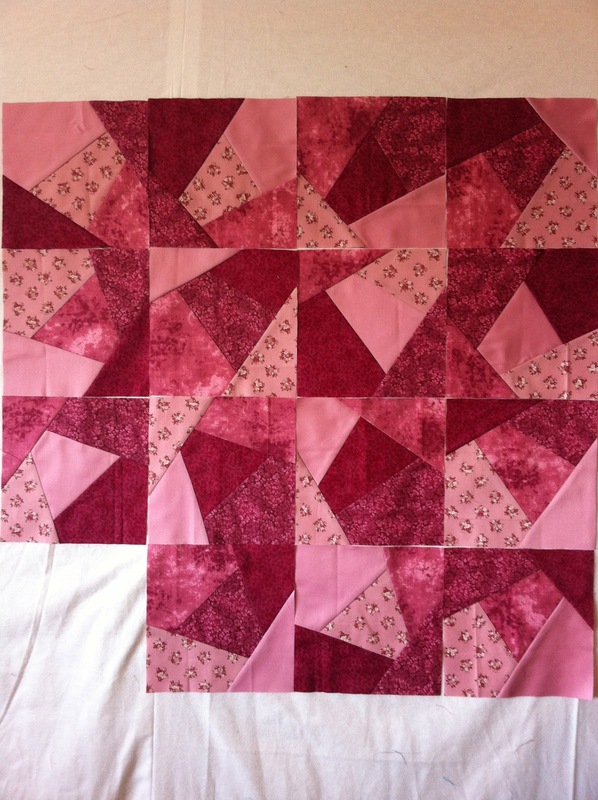 Arrange your blocks however you like - 16 blocks will make a nice table topper and as you can see, 20 blocks makes a great start on a baby quilt. Add a border or two, use a decorative stitch from your sewing machine to dress up the crazy patch, the possibilities are endless! Thanks for joining in for WiP Wednesday!